Any amount over the cost of the bricks will be used by the non-profit for entryway maintenance expenses. The OB CDC currently covers the costs of watering in the medians leading up to the entryway from the freeway. Bicycle parking stations were also being discussed, as a grant is available from County Supervisor Ron Robert’s office for $3600. 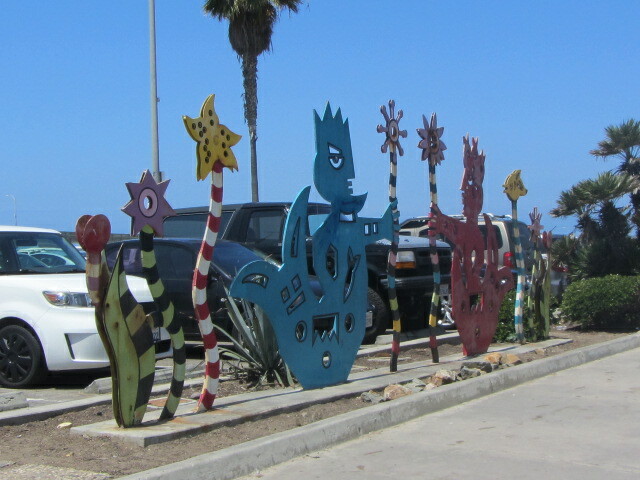 These will be placed at either end of the sculpture on Newport Avenue by the OB Pier parking lot. 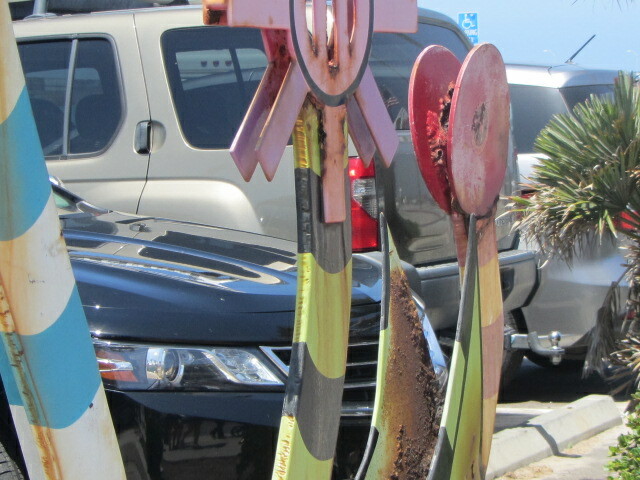 This sculpture by the way is in need of refurbishment, but cannot be simply re-painted. As a work of art, it must be refurbished. The cost for that is $60,000, so it does not look like it will happen any time soon. The main event at the OB CDC continues to be Veterans Plaza. Application has been made to the City of San Diego for a Coastal Development Permit. Major fundraising will not occur until the plans are approved. 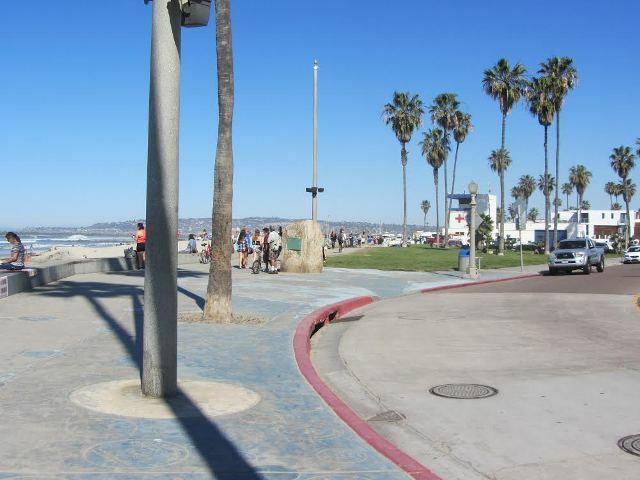 The plan area consists of the current Veterans Plaza and the area directly adjacent to the Lifeguard parking Lot. There is a large grassy area between the two development locations that is not included in the plans. No official responses have been received as the permit process is just beginning. If you have an interest in attending an OB CDC meeting, the best place to find out about them is the OB Rag “Events” Calendar, and the OB Mainstreet Association website. The OB CDC website requires a little more sleuthing. Minutes of the meeting are not available to the public and are not required. The next meeting is June 11 at 7:00 PM at the OB Rec center. 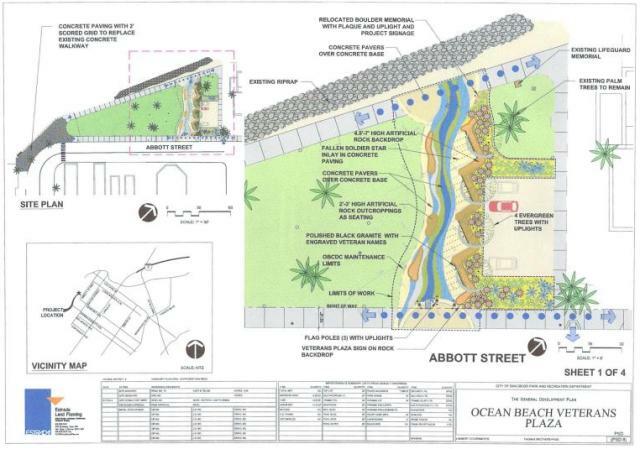 Here’s hoping the City of San Diego will hear loud and clear from Obeceans that we do NOT approve of this dinosaur of a Veterans’ Plaza that has been proposed. It’s too big, too expensive, and in the wrong place. Seems that it arrived out of left field, and should go back there. Any update on the Tot lot at Saratoga park? The Veterans Plaza will not require a DSD hearing or an OB Planning Board Review, as it is a “Process 1” permit. Parks & Rec will approve the right-of-entry permit required, if I have all of this straight. No updates on the Tot Lot. Well actually, if a project requires a Coastal Development permit, it has to come before the local planning board.